When every second counts, top performance is essential. 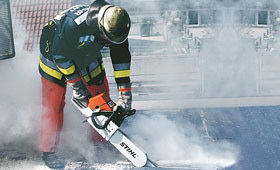 The powerful STIHL emergency services saw meets this key requirement. Even at medium speed, this special saw displays immense performance in rescue operations, fire fighting and emergency management. The cutting teeth of the special chain are armored by impact-resistant carbide plates, providing the perfect bite for extreme operations.